This entry was posted in Uncategorized and tagged Australian history. Bookmark the permalink. I recently read and enjoyed this book, too. Thanks for the excellent review. 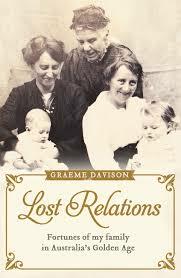 I hadn’t heard of Alison Light’s book, but I just looked it up and yes- it sounds very similar to Davison’s book. I must add it to my “for later” list too! I’ve discovered yet another Aussie read for my list 2018. This was a wonderful review and admire your writing. I will try harder to improve my reviews….with more depth and you have shown here!